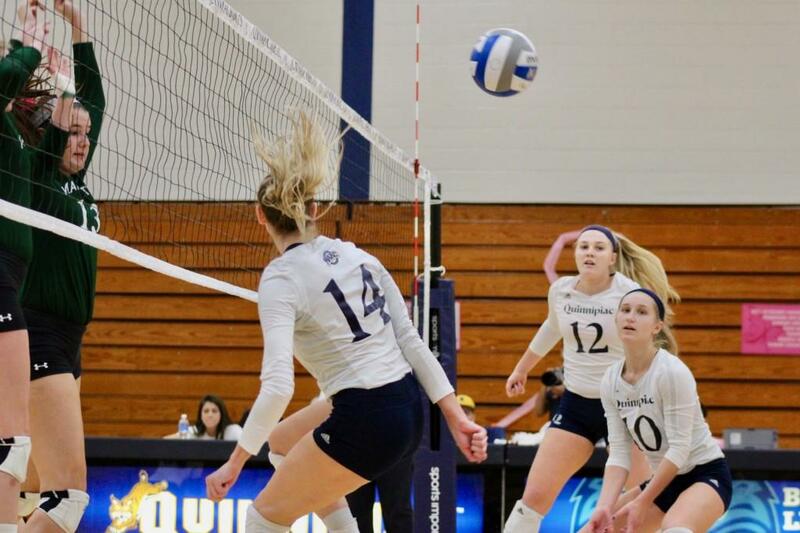 Entering today on a three-game win streak, the Quinnipiac women’s volleyball team fell to Niagara 3-1 at home in their last regular season game of 2017. The sixth-seeded Bobcats (10-21 overall, 9-9 Metro Atlantic Athletic Conference) struggled to dominate offensively in this match, ending with a 0.073 hitting percentage on the day. The second-seeded Purple Eagles (18-9 overall, 14-4 MAAC) utilized their strong defense and the height of their blockers to lock down another MAAC victory. The Bobcats started the afternoon by claiming the first set against the Purple Eagles 25-20. Junior outside hitter Kat Miller carried the team in every aspect of the game today, leading in kills (11), digs (21) and points total (17.5). However, the momentum from the first set did not carry over to the rest of the game. “We were trying to play with some lineups going into next week, so I think that messed up the flow and rhythm a little bit,” Czaplinski said. Back-and-forth scoring seemed to be the trend for the following three sets, as the Bobcats lost 23-25, 21-25 and 18-25. 33 attack errors and 10 service errors by the Bobcats was enough to grant the Purple Eagles a tally in the wins column. Defensively, both teams played to the best of their ability. Quinnipiac sophomore libero Alejandra Rodriguez racked up 17 digs to keep the Bobcats on the tails of the Purple Eagles throughout the last three sets. Niagara’s senior libero Rylee Hunt continued her dominating defensive performance with 25 digs. Hunt has collected seven MAAC Libero of the Week titles this season. While no loss is taken lightly, the Bobcats can sleep a little better knowing that they already clinched a spot in the MAAC tournament as the sixth seed. After starting the season with high hopes, the Bobcats lost crucial players to injury. Senior middle hitter Elizabeth Kloos and junior outside hitter Jen Coffey were both out for extended periods of time due to foot injuries. However, Kloos will make a return at the perfect time. As the Bobcats begin their pursuit for a MAAC tournament victory, her re-entry into the lineup will provide the offensive boom that is necessary for Quinnipiac success. Quinnipiac is scheduled to begin their MAAC tournament pursuit Friday at Fairfield. Their opponent is yet to be determined.